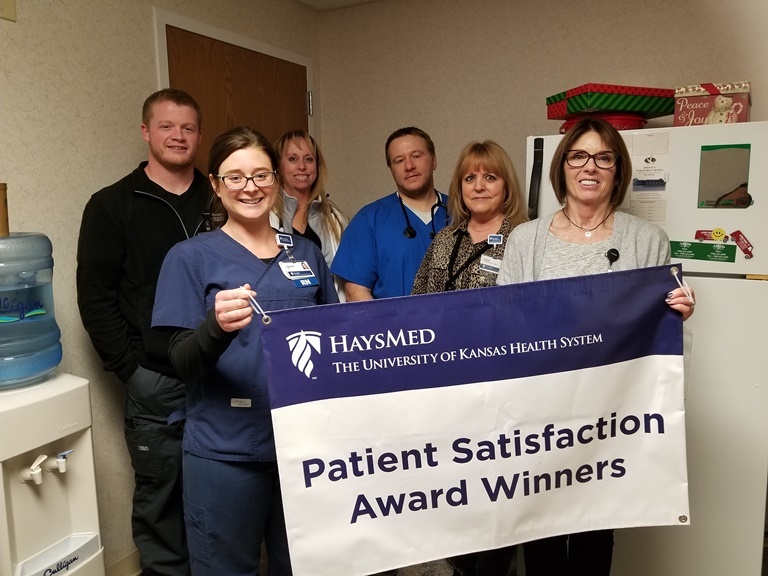 Hays, Kansas (Jan 10, 2018)—The Intensive Care Unit (ICU), Outpatient Rehabilitation Department, Pulmonary Clinic and Information Technology were recently named the patient satisfaction award winners for the third quarter of 2017 at HaysMed. 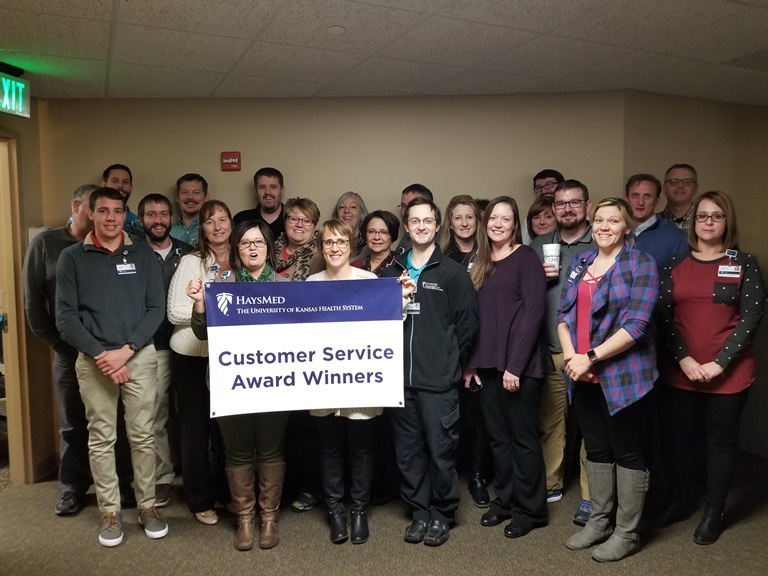 Each quarter HaysMed recognizes the patient satisfaction award winners based on results from CAHPS (Consumer Assessment of Healthcare Providers and Systems) surveys administrated by HealthStream. Health Stream is the research firm HaysMed contracts with to conduct the government required Consumer Assessment of Healthcare Providers and Systems (CAHPS) hospital surveys on patient experience. The CAHPS survey is the first national, standardized, publicly reported survey of patients’ perspectives of hospital care. The CAHPS Hospital Survey is a survey instrument and data collection methodology for measuring patients’ perceptions of their hospital experience. Four areas are recognized every quarter including an inpatient department, an outpatient department, a clinic and a non-clinical area. 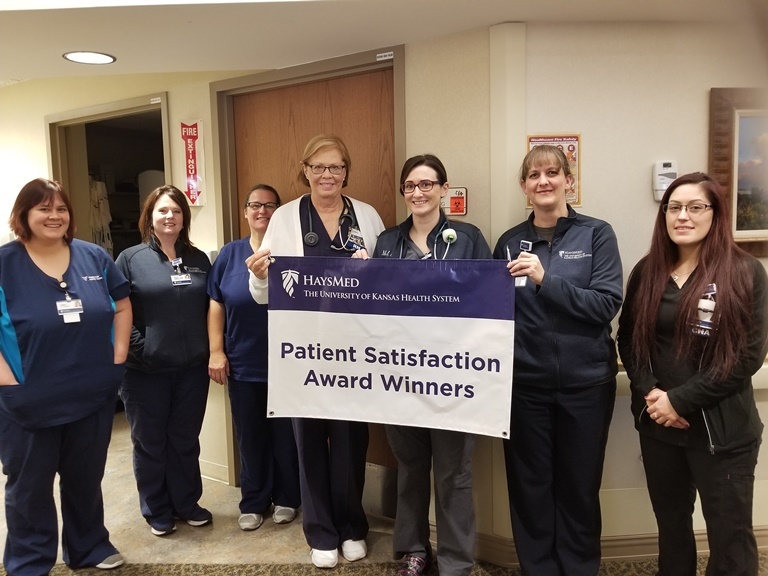 The ICU Department was recognized for having the highest in-patient overall rating. Their unit score was 100% putting them at the 99th percentile. The ICU is a 12 bed unit and they have 20 full time Associates. 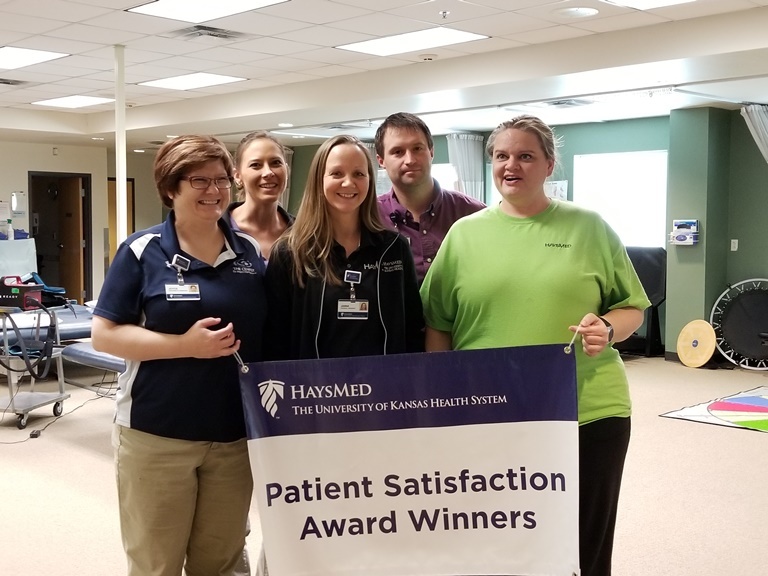 The Outpatient Rehabilitation, an outpatient department, received a score of 89.35% for patient overall rating which put them in the 80th percentile. The department has 13 full time staff members and provides 18,000 rehab treatments per year. Garnering the clinic award was the Pulmonology Clinic. They scored 100% which put them in the 99th percentile for patient overall rating. The Pulmonology Clinic has nine staff members, one physician and one nurse practitioner. Information Technology received the Customer Service Award for their services provided as one of the main infrastructures of the hospital. They provide support that enables all departments perform better and provide quality patient care. They have 35 full time Associates and handle over 20,000 help desk issues a year. They manage 300 servers and 100 applications and also provide IT services for Pawnee Valley Community Hospital and St. Rose Health Center.